Relish the memory. 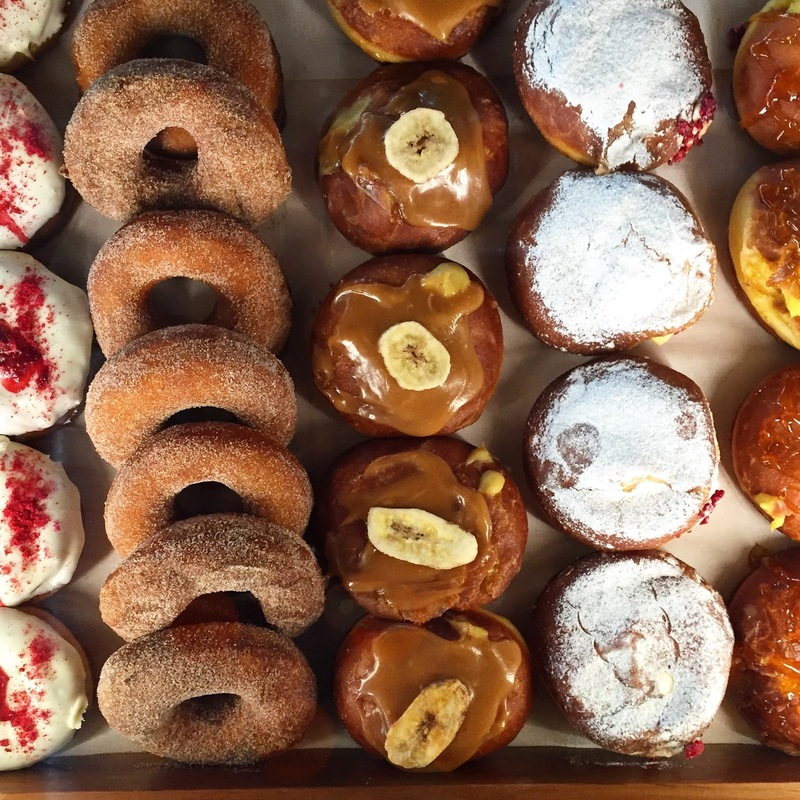 : The Donut Round Up. 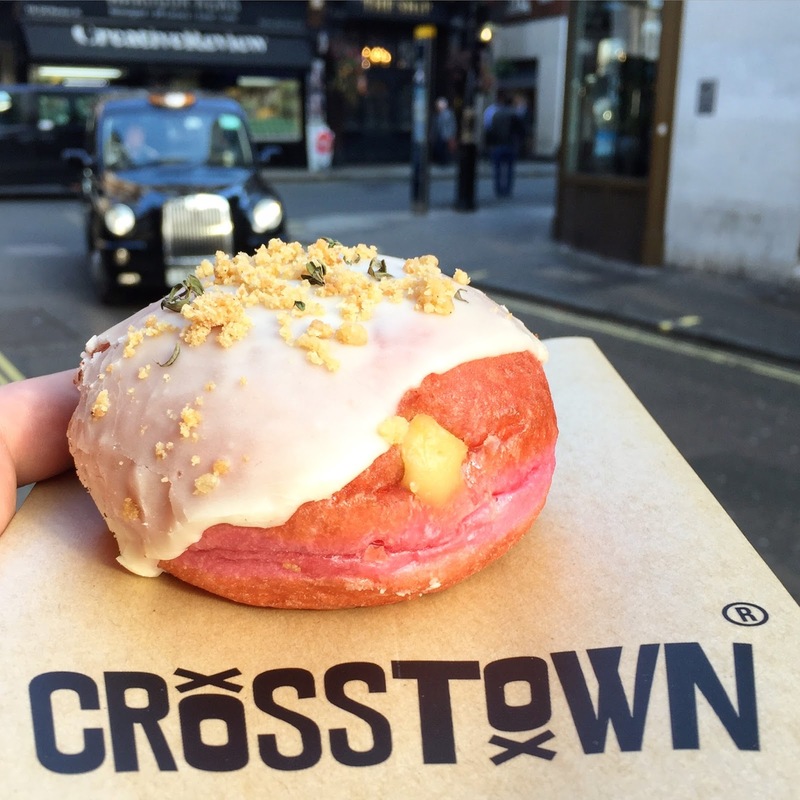 After spotting a 'Whittaker’s Peanut Slab' Waitangi Day Special from Crosstown Doughnuts on my Instagram feed I was forced to: a) crave donuts, b) feel seriously nostalgic about being a Kiwi and eating my way around London, and c) reflect upon the vast array of donuts I have recently devoured. If you follow @relishthememory on instagram you’ll know that I was lucky enough to have six weeks galavanting around Europe late last year (see: #rtmgoesglobal). I went with one mission - to EAT! And that’s exactly what I did. On the menu, was a true culinary adventure with a handful of the finest fellow food-loving female counterparts. Although not all of this sugar dipped goodness was divulged on this trip, the remainder of this list has been consumed since my return home. 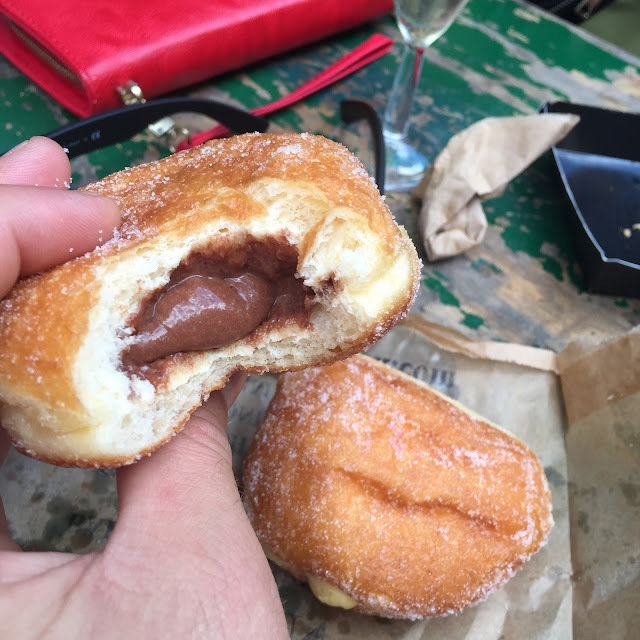 St John Donuts – Sugar dipped, stuffed with Vanilla Bean Custard & Chocolate Mousse. St John Maltby, Maltby Street Market, London. A small brick laneway market full of tantalizing smells and drool-worthy morsels. Everything from giant pans of cheesy potato bake, ten varieties of British Scotch eggs and even a Pic’s Peanut Butter stall (proud kiwi moment!). 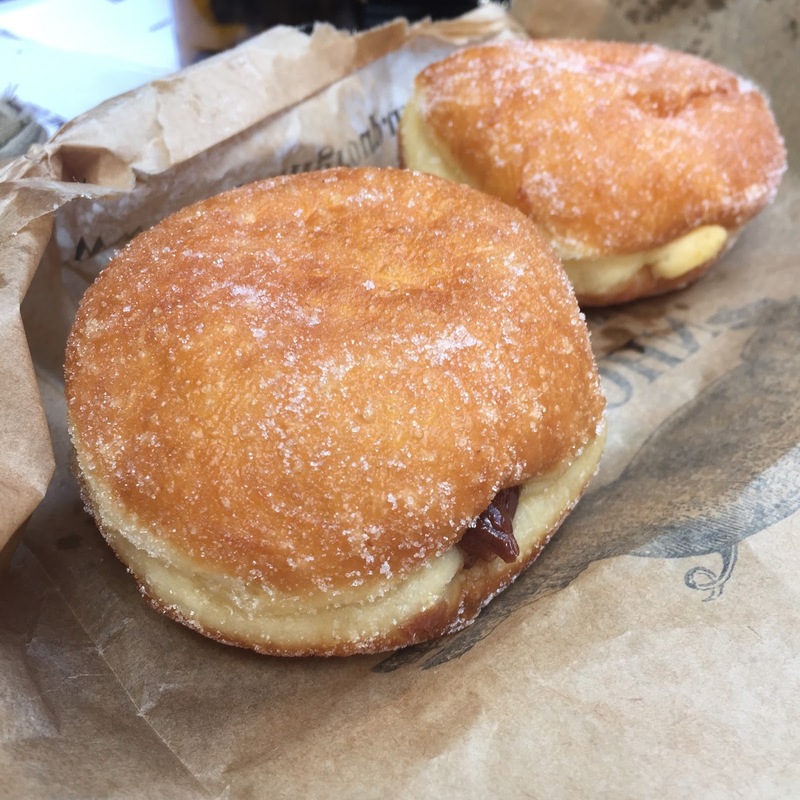 With hungry punters in every direction we swarmed our way through the crowds – with my cousin gunning it straight for the ‘St John’ bakery, scoring the last few donuts of the day. Washed down with bubbles, it made for a truly fabulous London laneway experience. After insta-stalking these guys from afar I was determined to get my hands on one of these fascinating savoury-esqe donuts. Following a massive Indian feast at Dishoom, I dragged my fellow-feaster kicking and screaming to hunt this guy down. Perfectly soft, full of herby creamy goodness and pink(!) in every way. Pumpkin Sourdough w. Nutmeg Spiked Custard, Cream Cheese Icing, Orange Zest & Pumpkin seeds. 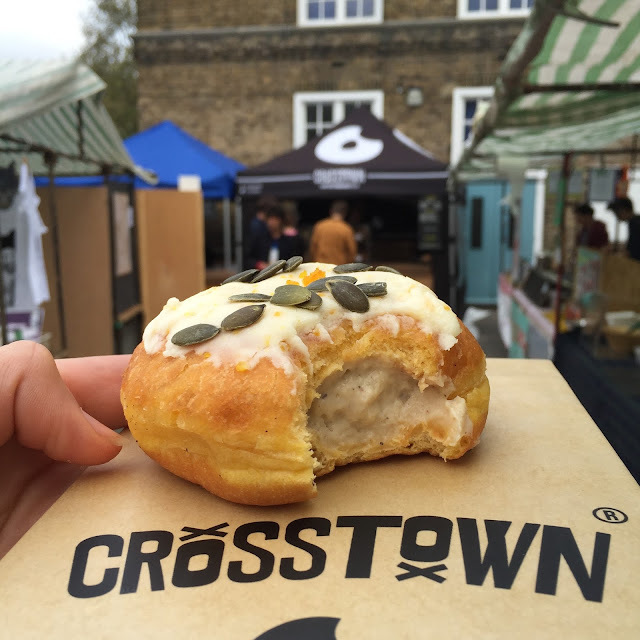 Crosstown Doughnuts, Broadway Market Stall, Dalston. Displeased with myself for not purchasing two flavours at the Soho store, I was euphoric upon spotting the Crosstown stall on my Broadway Market excursion with the finest kiwi tour guides! An autumn twist with another intriguing balance of soft, chewy sourdough, spicy custard and no offensive sugar hit. I also grabbed a Peanut Butter & Jam version for the aforementioned fellow feaster, as an ironic apology for making her eat so much. Needless to say, she was most grateful. 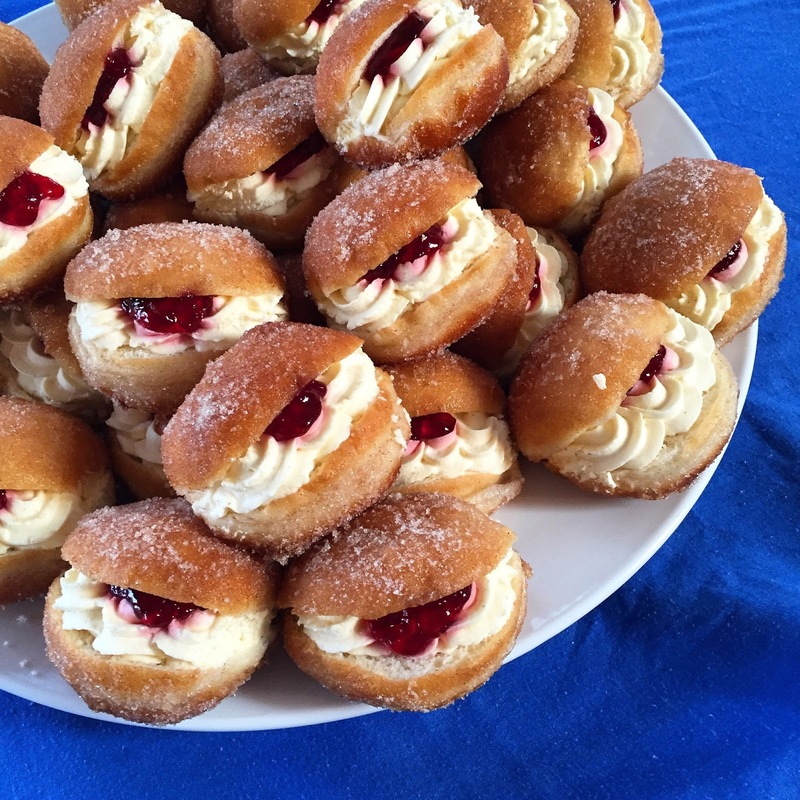 Two Giant Handmade Jam and Cream Donuts, plus several of the same mini donuts. The Whipped Baker, Tauranga Farmers Market. I ordered these special guys for my Dad to enjoy down at his whitebaiting spot for his 60th Birthday. As you can see they were HUGE. Filled with fresh cream, encased in a soft doughy exterior and dunked in crunchy sugary goodness. Dad’s donut love was at an all time high after these beauties. Sharing the donut love I also ordered mini versions for his 60th birthday bash, enjoyed by guests after Dad pulled his cake-face-planting party trick and threw a few to the crowd for good measure. What a guy! 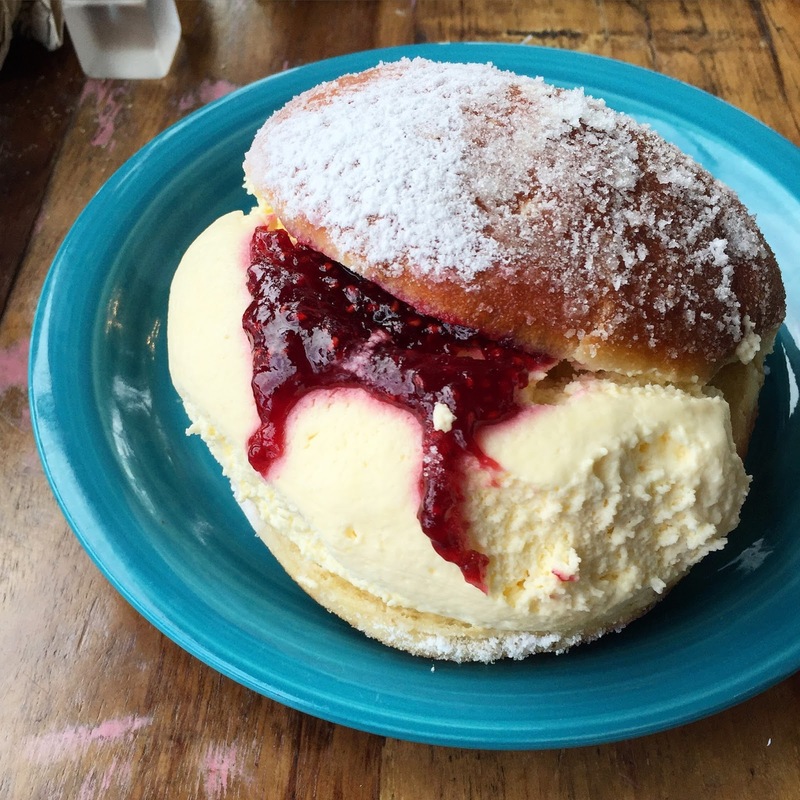 Fresh Jam and Cream Donut featuring generous amounts of cream and signature raspberry jam. Little Sister Café, Henderson, Auckland. Well-known in the West, this café does a damn fine version of a donut. With an outrageous cream to dough ratio it made the post-holiday-first-week-back-to-work a little less painful. Particularly when your boss is paying. 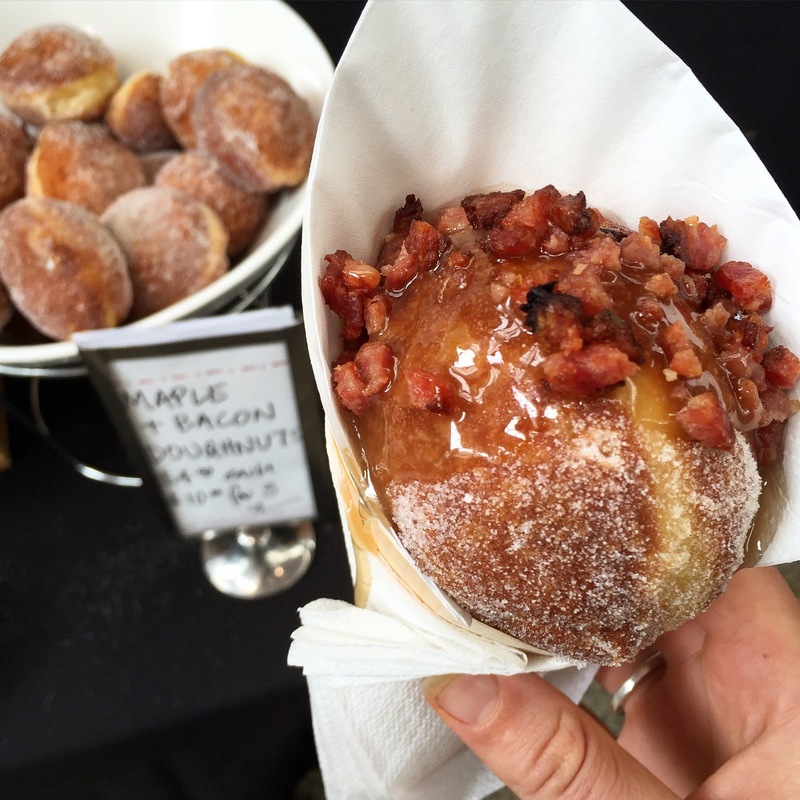 Maple & Bacon Sugar Crusted Doughnut. Martin Bosley, City Market, Wellington. Following a thought-provoking and fulfilling few days of food chat (and feasting) at the NZ Foodwriters Conference – this salty, sugary wee number was the perfect finale to the weekend. After proving brioche dough in the early hours of the morning the man himself – a highly acclaimed NZ Chef – is right at home feeding hungry Wellingtonian’s with the best Free Range Bacon and Egg Butties in town. 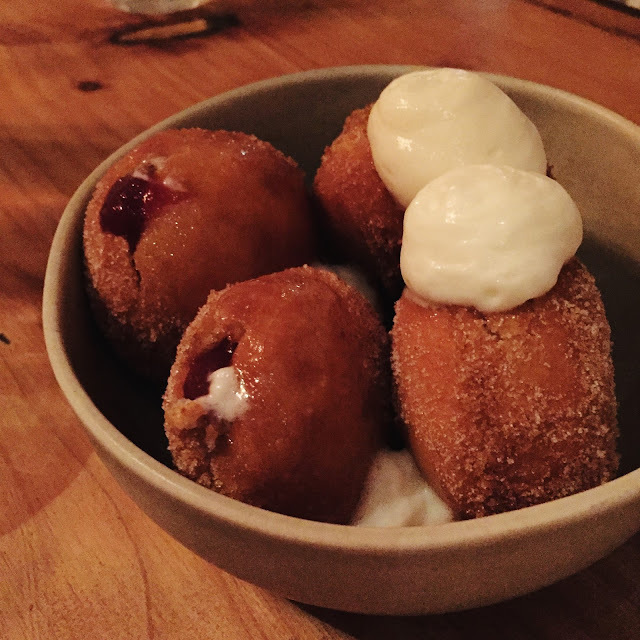 Mini Sourdough Donuts w. Tamarillo Compote & Goats Cheese Foam. Orphans Kitchen, Ponsonby Rd, Auckland. No stranger to the Auckland food scene – Orphans Kitchen is well known for pushing boundaries and serving up thoughtful ingredients in an interesting way. These doughnuts were no exception. With a decent amount of sourdough chew, the tart tamarillo tang, the airy foam goats cheese and light sugar dust made for a seriously memorable mouthful. Raspberry & White Chocolate, Cinnamon, Salted Caramel Banana, Classic Custard & Crème Brulee. Public Catering Company, New Plymouth. Pre-engagement party antics in the 'Naki' consisted of lunching on luscious donuts with the ladies. Tangy raspberries balancing sweet white chocolate, toffee drizzle for crunch on the crème brulee and salted caramel banana-filled custard for the win. 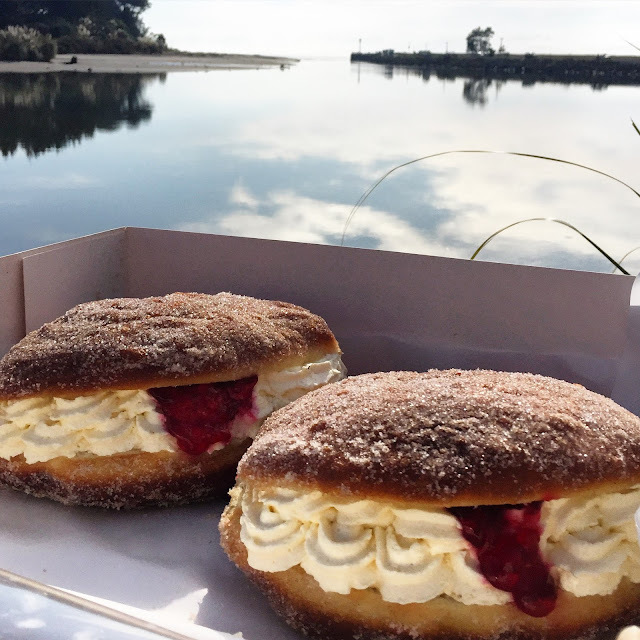 If you are looking for another reason to get yourself down to Taradise – these are it. *Disclaimer - I have chosen to interchangeable use the spelling of both 'doughnut' and 'donut'. Mostly because when it comes to doughy's, I don't like to discriminate. All of these donuts look INSANE! Love this!